Sometime in 2019 or 2020 India will send ISRO’s solar mission Aditya-L1 to a vantage point in space, known as the L1 Lagrange point, to do imaging and study of the sun. This launch will happen in the early part of the next solar cycle - an occurrence in which sunspots form on the face of the sun, growing in size and number and eventually diminishing, all over a period of eleven years. It will be a mission of many firsts. The so-called L1 point is 1.5 million kilometres away. Here, due to the delicate balance of gravitational forces, the satellite will require very little energy to maintain its orbit. Also it will not be eclipsed from the sun. The 1,500-kg class satellite will be programmed to orbit this point and image the sun’s magnetic field from space for the very first time in the world. Scientists hope to capture the close-ups of the sun from here, uninterrupted by eclipses for years. Few other space agencies have successfully placed their satellites at this location. Among the few, the Solar and Heliospheric Observatory (SOHO), a NASA-ESA collaboration involving America and Europe, and NASA’s Advanced Composition Explorer (ACE) are at L1 exclusively to study the sun and space weather, respectively. 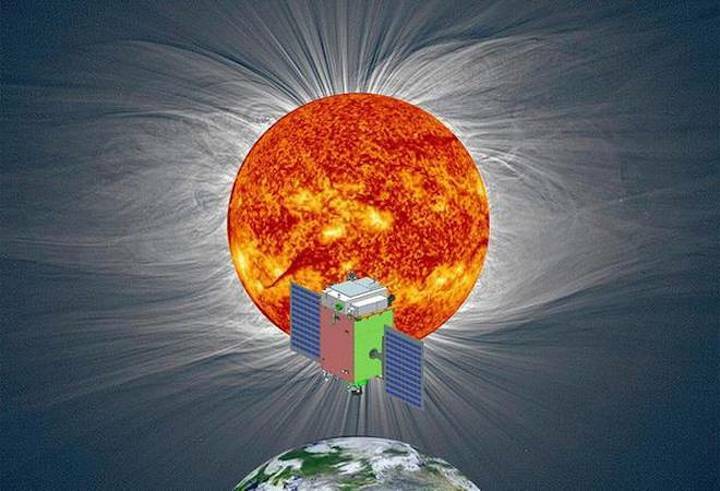 Aditya-L1 is expected to be the very first to study from space two months from the time of launch, the magnetic field of the sun’s corona. The corona is the outer layer that we see during total solar eclipses. It will be the first 100% Indian mission which will not only negotiate a challenging orbit, but will also benefit the global scientific community in understanding the sun. Earlier, the NASA-ESA mission SOHO was launched in 1995, and while it made many discoveries, its coronagraph, meant to image the sun, broke down shortly after the mission commenced. Hence there is currently no satellite imaging the sun from space. Aditya-L1 will not only fill this gap it will also literally, look deeper into the sun than SOHO. “The nominal mission lifetime is expected to be five years, though it is expected to go on for much longer, perhaps even ten,” says Dipankar Banerjee from Indian Institute of Astrophysics (IIAP), Bengaluru, which is collaborating with ISRO on this project. The mission will carry seven payloads,consisting of a coronagraph, equipment that will image the sun using ultraviolet filters, X-ray spectrometers, and particle samplers all being made within the country. The largest payload, or instrument, aboard the satellite, will be the Visible Emission Line Coronagraph (VLEC). This can view the sun more closely than has been done before even by SOHO.